Although non-typeable (NT) Haemophilus influenzae and Haemophilus haemolyticus are closely related human commensals, H. haemolyticus is non-pathogenic while NT H. influenzae is an important cause of respiratory tract infections. Phase-variable phosphorylcholine (ChoP) modification of lipooligosaccharide (LOS) is a NT H. influenzae virulence factor that, paradoxically, may also promote complement activation by binding C-reactive protein (CRP). CRP is known to bind more to ChoP positioned distally than proximally in LOS, and the position of ChoP within LOS is dictated by specific licD alleles (designated here as licD I , licD III , and licD IV ) that are present in a lic1 locus. The lic1 locus contains the licA-licD genes, and ChoP-host interactions may also be influenced by a second lic1 locus that allows for dual ChoP substitutions in the same strain, or by the number of licA gene tetranucleotide repeats (5'-CAAT-3') that reflect phase-variation mutation rates. Using dot-blot hybridization, 92% of 88 NT H. influenzae and 42.6% of 109 H. haemolyticus strains possessed a lic1 locus. Eight percent of NT H. influenzae and none of the H. haemolyticus strains possessed dual copies of lic1. The licD III and licD IV gene alleles were distributed similarly (18-22%) among the NT H. influenzae and H. haemolyticus strains while licD I alleles were present in 45.5% of NT H. influenzae but in less than 1% of H. haemolyticus strains (P < .0001). NT H. influenzae had an average of 26.8 tetranucleotide repeats in licA compared to14.8 repeats in H. haemolyticus (P < .05). In addition, NT H. influenzae strains that possessed a licD III allele had increased numbers of repeats compared to NT H. influenzae with other licD alleles (P < .05). These data demonstrate that genetic similarities and differences of ChoP expression exist between NT H. influenzae and H. haemolyticus and strengthen the hypothesis that, at the population level, these differences may, in part, provide an advantage in the virulence of NT H. influenzae. Strains of non-typeable (NT) Haemophilus influenzae asymptomatically colonize the human pharynx, but are also opportunistic pathogens that cause localized respiratory tract infections such as otitis media, pneumonia, bronchitis, sinusitis, and COPD exacerbation [1, 2]. Bacterial factors that differentiate disease from commensal strains are largely unknown since the population structure of NT H. influenzae is genetically heterologous . The association of bacterial factors with disease-causing strains can be inferred, however, by comparing the prevalence of genetic traits between epidemiologically defined collections of disease and commensal strains [4–7] or, alternatively, between the pathogenic species and a phylogenetically close but non-pathogenic relative [8–11]. Haemophilus haemolyticus is a phylogenetically close relative of NT H. influenzae, but has not been associated with disease [7, 12, 13]. The two species reside in the same host niche, overlap extensively by both taxonomic and phylogenetic analyses [10, 14, 15], and exchange DNA through natural transformation [10, 13, 16]. Given their close relationship, but difference in disease potential, NT H. influenzae and H. haemolyticus likely possess common genes or genetic traits for commensal growth but differ in genes or traits that facilitate disease . Historically, H. haemolyticus has been considered a rarely encountered commensal that was easily differentiated from NT H. influenzae by its hemolytic phenotype [17–19]. Recent studies, however, have shown that 20-40% of isolates in various NT H. influenzae collections were miss-classified, and found to be non-hemolytic H. haemolyticus[7, 13]. These observations suggest that H. haemolyticus is significantly more prevalent in the pharynges than previously thought, and that clinical differentiation of the species from throat and sputum samples is inadequate . Therefore, we recently sought to differentiate the species by their relative proportions of selected NT H. influenzae virulence genes and observed that a probe made to licA, a NT H. influenzae gene necessary for phosphorylcholine (ChoP) modification of LOS, hybridized to 96% of NT H. influenzae isolates and to 42% of H. haemolyticus isolates . The relationship of ChoP expression between NT H. influenzae and H. haemolyticus is unknown but differences between the species may highlight important roles in NT H. influenzae virulence. In studies addressing NT H. influenzae virulence, ChoP-modified LOS has been shown to promote bacterial adherence and invasion of host cells through interaction with the platelet activating factor receptor, to increase bacterial resistance to host antimicrobial peptides such as cathelicidin (or LL-37/hCAP18), and to modulate the host inflammatory response directed toward bacteria present in biofilms [20–22]. Paradoxical to its role in enhancing colonization and virulence, ChoP can bind C-reactive protein (CRP) which initiates C1q binding that leads to activation of the classical complement pathway and bactericidal killing . The concentration of CRP (in both serum and respiratory tract secretions) dramatically increases during inflammation, and has been proposed to facilitate clearance of ChoP-expressing bacteria in the respiratory tract [24, 25]. Human ChoP-specific antibodies capable of eliciting in vitro bactericidal activity against some H. influenzae strains have also been identified, suggesting a further liability of H. influenzae ChoP expression . H. influenzae may avoid CRP and anti-ChoP antibody binding, however, by phase varying ChoP expression and by strain-dependent localization of ChoP substitutions within LOS [27, 28]. In H. influenzae, ChoP expression is controlled by a contingency locus, lic1, that contains the licA, licB, licC, and licD genes (encoding a choline kinase, a choline permease, a pyrophosphorylase, and a diphosphonucleoside choline transferase, respectively) . Contingency loci, such as lic1, contain simple sequence repeats (SSR) that provide an organism with the ability to phase vary specific phenotypes in response to host challenges . In lic1, the SSR are tetranucleotide (5'-CAAT-3') and are present at the 5' end of licA, the first gene in the locus . During replication, intragenic SSR repeats undergo slipped-strand mispairing which results in translational phase variation, and the rate of these mutations is proportional to the length of the repeat region . De Bolle et al  found that mutation rates of a H. influenzae type III restriction modification gene (mod) engineered to contain 17-38 tetranucleotide (AGTC) intragenic repeats increased linearly with the number of repeats. In contrast, the same gene containing 5-11 repeats demonstrated rare, if any, phase-variation. Thus, higher numbers of repeats in a contingency locus may protect the bacteria by decreasing the response time to host challenges . Among H. influenzae strains, however, the number of licA gene 5'-CAAT-3' repeats range from 3-56, and patterns pertaining to virulence have not been identified [32, 33]. Depending on the H. influenzae strain, ChoP may be substituted at different positions within LOS. Substitutions may occur on oligosaccharides that extend from any one of the three conserved inner-core heptose residues (heptose I, II, and III) or, alternatively, directly to heptose IV, an outer core heptose that extends from heptose I [34, 35]. These substitutions are dictated largely by the diphosphonucleoside choline transferase encoded by the licD gene. Three licD gene alleles mediate ChoP substitutions at different positions within LOS and, for simplification, we have named the alleles to reflect their association with a given heptose-residue: licD I , licD III , and licD IV . Although ChoP has been associated with heptose II residues in selected strains, a specific licD allele mediating these substitutions has not been experimentally documented . The deduced LicD proteins are 265-268 amino acids in length and range in sequence identity from 74-88% with much of the variation occurring in the central part of the primary structure [28, 35]. Although most NT H. influenzae strains possess a single licD allelic gene that facilitates one ChoP substitution, Fox et al  recently reported that 4/25 (16%) of NT H. influenzae middle ear strains possessed two different licD alleles, each present in a separate, phase-variable lic1 locus, that together could produce up to two ChoP substitutions in the strain's LOS. Both the number and position of ChoP substitutions within LOS may affect binding of host clearance molecules such as CRP or natural ChoP antibodies [26, 28]. For instance, H. influenzae strains with dual ChoP substitutions bind more CRP, and H. influenzae strains with ChoP substitutions positioned from the distal heptose III residue are 10-fold more sensitive to CRP-initiated bactericidal killing than ChoP associated with the proximal heptose I in the same strains [28, 35]. Consequently, strains with proximal ChoP substitutions (i.e. heptose I) may be more protected from CRP-mediated clearance, and LOS structural studies on selected NT H. influenzae strains have found that ChoP predominate at this position . The overall prevalence of these substitutions in the NT H. influenzae population, however, is not known. Differences in the prevalence of single or combined licD gene alleles between NT H. influenzae and H. haemolyticus may reflect the importance of ChoP structures in NT H. influenzae virulence. The presence of a licA gene in H. haemolyticus suggests that it may contain a lic1 locus and express ChoP in a manner similar to H. influenzae. Since ChoP expression among NT H. influenzae strains can vary greatly due to genetic factors listed above, we speculated that differences in the prevalence of these factors between strain populations of H. influenzae and H. haemolyticus may highlight, in part, which ones provide an advantage to H. influenzae in transcending from commensal to disease-related growth. Although H. influenzae is known to modify its LOS with ChoP, expression and surface localization of ChoP in H. haemolyticus has not been demonstrated. To investigate ChoP expression in H. haemolyticus, we obtained LOS profiles on silver-stained tricine SDS-PAGE from whole-cell lysates on three H. influenzae control strains, six H. haemolyticus strains containing a licA gene, and five H. haemolyticus strains lacking a licA gene . As seen in Figure 1 (upper panel), both NT H. influenzae and H. haemolyticus demonstrated intra-and inter-strain variability in LOS migration. A duplicate gel was transferred to a Western immunoblot and ChoP was detected with TEPC-15, a mAb that recognizes ChoP on a number of pathogenic bacteria [36–38]. TEPC-15 reacted with LOS-associated bands in all H. influenzae control strains and in the six H. haemolyticus strains that contained a licA gene (Figure 1 lower panel). The antibody, however, did not react to five H. haemolyticus strains lacking a licA gene (Figure 1 lower panel). The association of ChoP epitopes with H. haemolyticus LOS was further supported by proteinase K digestion experiments. TEPC-15 reactivity was still present on Western immunoblots containing H. influenzae strain Rd and H. haemolyticus strain M07-22 that were pre-treated with proteinase K, although no proteins were visible in these preparations when they were run on glycine SDS-PAGE and stained with Coomassie (data not shown). Together these results suggest that, similar to H. influenzae, some strains of H. haemolyticus can express a ChoP epitope that is localized within its LOS. The ability of H. haemolyticus to hybridize with a H. influenzae licA gene probe suggests that H. haemolyticus contains a lic1 locus . In H. haemolyticus strains M07-22 and 60P3H1, licA-licD gene probes were each found to hybridize with one restriction fragment on Southern blots, suggesting that all genes were confined to a single locus in each strain (data not shown). PCR designed to amplify overlapping regions of H. influenzae lic1 locus genes also amplified similar products in H. haemolyticus strains M07-22 and 60P3H1, and DNA sequencing of these products revealed that the strains contained tandem licA-licD genes spanning 3375 and 3324 bp [GenBank: HM140372 and HM140373], respectively, similar in size to the lic1 loci present in the genome-sequenced H. influenzae strains Rd (3358 bp) and 86-028NP (3333 bp) [39, 40]. Further comparisons of the lic1 loci between H. haemolyticus and H. influenzae revealed that, in both species, the loci were flanked by the same chromosomal genes, contained licA α, β, and γ start codons positioned immediately upstream of tandemly arranged tetranucleotide (5'-CAAT-3') repeats, and contained licB and licC start codons that overlapped each preceding gene (data not shown). The LicA, LicB, and LicC amino-acid sequences for the two H. haemolyticus strains M07-22 and 60P3H1 were deduced and found to be 93, 99, and 95% identical, respectively, between the strains (Table 1). Amino-acid sequences comparisons of the putative LicA, LicB, and LicC proteins between H. haemolyticus and H. influenzae (strains E1a, Rd, and 86-028NP) revealed identities that were somewhat lower, ranging from 87-94% for all comparisons (Table 1). As mentioned above, three LicD protein alleles (LicDI, LicDIII, and LicDIV) have been described for H. influenzae. The LicD protein of H. haemolyticus strain M07-22 was 89 and 87% identical to the LicDI allele of H. influenzae strains Rd and 86-028NP, respectively, but was 95% identical with and contained a 3 amino-acid insertion similar to the LicDIII allele of H. influenzae strain E1a, suggesting that this H. haemolyticus strain possessed a LicDIII allele (Table 1). In contrast, the putative LicD protein of H. haemolyticus strain 60P3H1 averaged only 69% identity with the LicD alleles of H. haemolyticus strain M07-22 and the three H. influenzae strains (Table 1). BLAST analysis, however, revealed that it was 99% identical to the deduced LicDIV protein of NT H. influenzae strain R2866, suggesting that H. haemolyticus strain 60P3H1 contained a LicDIV allele. Together, these data suggest that H. haemolyticus possess lic1 loci that are very similar to the lic1 loci described for H. influenzae. As mentioned, the prevalence of the licA gene has been reported for a phylogenetically defined NT H. influenzae and H. haemolyticus strain collection . We therefore determined the distribution of the remaining lic1 locus genes (licB, licC, and licD) among the same strains by dot-blot hybridization. The licB-licD gene probes each hybridized to three H. influenzae positive control strains (Rd, 86-028NP, and R2866), to 81/88 (92%) NT H. influenzae strains and to 46/109 (42.2%) H. haemolyticus strains. Four NT H. influenzae strains (53122, B01-21, H08-25, and H10-21) that previously hybridized with the licA gene probe did not hybridize with the licB-licD probes. In addition, one NT H. influenzae strain (32324) that did not previously hybridize with the licA gene probe did hybridize with the licB-licD probes in this study. Repeat hybridization of these discrepant strains with the licA gene probe revealed that licA hybridization was concordant with licB-licD hybridization, and that all strains either lacked or possessed all four lic1 locus genes. The probes did not hybridize to a negative control species (N. meningitidis) or to any of the remaining NT H. influenzae or H. haemolyticus strains that previously failed to hybridize with the licA gene probe (Table 2). The absence of the licA-licD genes in these strains suggests that 8% of NT H. influenzae and 57.8% of H. haemolyticus strains lack a lic1 locus for ChoP expression, and that absence of a lic1 locus is 7.23 times more prevalent in H. haemolyticus than in NT H. influenzae (expressed in Table 2 as 0.14 times prevalent for NT H. influenzae, P < .05). a Prevalence ratios (PR) were calculated for H. influenzae using H. haemolyticus as the referent group. b Logit, 0.5 used in place of 0 for PR and statistical calculations. c P < 0.05 is considered statistically significant using χ2 analysis. The prevalence of NT H. influenzae and H. haemolyticus strains possessing single or duplicate lic1 loci is not known. Similar to the method reported by Fox et al , we screened our 81 NT H. influenzae and 46 H. haemolyticus lic1-containing strains for duplicate lic1 loci using Southern hybridization of Mfe 1 digested genomic DNA to identify two restriction fragments that hybridized with a licD gene probe. Strains with two licD-hybridizing bands were present in seven NT H. influenzae strains and in none of the H. haemolyticus strains. Further hybridization using a licA gene probe on the seven NT H. influenzae strains also revealed two licA hybridizing bands in these strains, suggesting that they possessed two complete lic1 loci. Assessing the population prevalence of lic1 locus copy number among the species, the data suggest that 74/88 (84%) NT H. influenzae and 46/109 (42.2%) H. haemolyticus possess one copy of lic1, and that strains with one lic1 locus are 2.18 times more prevalent in NT H. influenzae than in H. haemolyticus (P < .0001) (Table 2). Duplicate lic1 loci were present in 7/88 (8%) NT H. influenzae and 0/109 (0%) H. haemolyticus strains, suggesting that duplicate lic1 loci in H. haemolyticus are rare or altogether absent (Table 2). Determining the prevalence of the three previously described licD alleles among the two species was initiated by PCR amplification and DNA sequence analysis of the licD genes from the 74 NT H. influenzae and 46 H. haemolyticus strains in our collection that contained a single lic1 locus. The deduced LicD amino-acid sequences of these strains were determined [GenBank:HM133649-HM133768] and the licD gene from one NT H. influenzae strain (Mr27) was repeatedly found to possess a nonsense mutation that would result in gene termination. A minimum-evolution dendrogram (in radiation view) was created from the remaining LicD amino-acid sequences of the NT H. influenzae and H. haemolyticus strains. 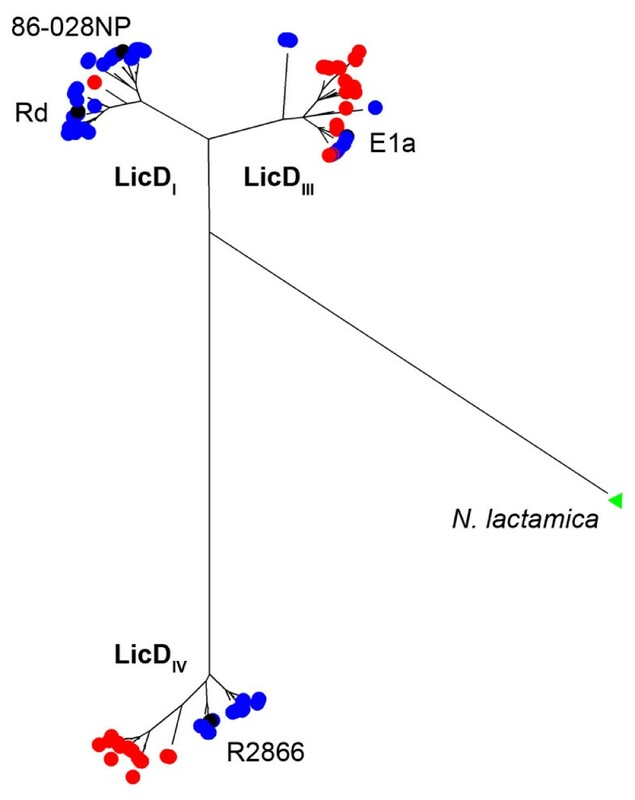 The dendrogram revealed three distinct clusters, each containing a different H. influenzae prototype LicD allele (LicDI from strains Rd and 86-023NP, LicDIII from strain E1a, and LicDIV from strain R2866) (Figure 2). These results suggest that the three previously defined LicD alleles represent the major allelic variants found among the H. influenzae and H. haemolyticus species. Clustering of H. influenzae and H. haemolyticus LicD alleles. The major clusters of H. influenzae (blue dots) and H. haemolyticus (red dots) strains are labeled by their predicted allele (LicDI, LicDIII, and LicDIV) and prototype LicD alleles from H. influenzae strains are shown for each cluster (black dots, E1a is partially hidden). The LicD protein of N. lactamica is the out-group for the analysis (green triangle). Next, we determined the population prevalence of specific licD alleles in our NT H. influenzae and H. haemolyticus strains. Among the 88 total NT H. influenzae strains in the collection, 43 (49%) possessed a single licD I allele, 19 (22%) possessed a single licD III allele, and 25 (28%) possessed a single licD IV allele (Table 2). In contrast, only 1 of the 109 (0.9%) H. haemolyticus strains possessed a licD I allele while 23 (21%) possessed a single licD III allele and 23 (21%) possessed a single licD IV allele. Although the prevalence of single licD I alleles was statistically different between NT H. influenzae and H. haemolyticus (P < .0001), the prevalence of the licD III and licD IV alleles was not statistically different between the species (Table 2). Assessment of licD gene alleles among the seven dual lic1 locus-containing NT H. influenzae strains was determined by PCR amplifying and sequencing licD from agarose gel slices of strain DNA digested with Mfe 1. The results revealed that 4/88 (4.5%) strains had licD III -licD IV alleles, while only 1/88 (1.1%) strains each were found to possess combinations of licD I -licD III , licD I -licD IV , and licD I -licD I alleles (Table 2). Together, these results suggest that the licD I allele is rarely present in H. haemolyticus, and that the proportions of licD III and licD IV alleles are similar between the species. Phase variation of ChoP expression is similar between NT H. influenzae and H. haemolyticus. The licA genes of H. haemolyticus strains M07-22 and 60P3H1 contained a number of 5'-CAAT-3' repeats that would place the licA gene in a correct translational open reading frame (data not shown). ChoP expression in these two strains was corroborated by Western immunoblot where TEPC-15 reactive epitopes were present in each strain (Figure 1, lanes 4 and 5). In addition, phase-negative variants could be isolated from each H. haemolyticus strain, and DNA sequence analysis revealed that each licA repeat region gained one 5'-CAAT-3' repeat, placing the licA gene out of frame (data not shown). Mutation rates in contingency loci are proportional to the length of the repeat region in the loci and the repeat region length may therefore affect the ability of bacteria to respond to a host immunologic challenge . To determine if a general population difference of licA repeat length exists between the species in this study, we compared the number of licA 5'-CAAT-3' repeats between the 74 NT H. influenzae and 46 H. haemolyticus strains that contained a single lic1 locus. DNA sequence analysis of PCR amplified repeat regions from these strains revealed a wide range in repeat numbers for both species (5-45 and 6-56 repeats for NT H. influenzae and H. haemolyticus, respectively) (Figure 3, Table 3). The average number of licA repeats between the species, however, was statistically different with NT H. influenzae having a mean of 27 repeats and H. haemolyticus having a mean of 15 repeats (P < .0001 using the student's T test) (Table 3). These results suggest that, at the population level, the contingency response for ChoP expression may be slower for H. haemolyticus than for NT H. influenzae. Distribution of NT H. influenzae and H. haemolyticus strains with various numbers of CAAT repeats. Percent of lic1-positive NT H. influenzae and H. haemolyticus strains based on the number of CAAT repeats they contain. NT H. influenzae and H. haemolyticus are labeled in blue and red, respectively. H. influenzae strains that express ChoP at more distal positions in LOS (i.e. ChoP substituted on an oligosaccharide extending from heptose III) have been shown to be more vulnerable to CRP binding, leading to activation of complement mediated bactericidal killing . Therefore, strains may differ in their licA mutation rates depending on which LOS structure is modified with ChoP. To test this, we further stratified the number of licA gene repeats between strains with different licD alleles for each species. Among NT H. influenzae, the range of repeats was similar among strains that possessed a licDI, licD III , or licD IV allele (6-45, 5-43, and 9-42 repeats, respectively) (Table 3). The average number of repeats was significantly different, however, for strains that possessed a licD III allele (34 repeats) than for strains that possessed a licDI or licD IV allele (25 and 26 repeats, respectively) (P = .015 and .032 using the student's T test, respectively) (Table 3). Among H. haemolyticus, the range of licA repeats was more variable between strains with licD III and licD IV alleles (6-56 and 6-27 repeats, respectively), due mainly to three licD III -containing strains with licA genes that contained 39, 40, and 56 repeats (Table 3, Figure 3). In contrast to NT H. influenzae, however, the average number of repeats was not significantly different between H. haemolyticus strains possessing licD III or licD IV alleles (16 and 13, respectively) (Table 3). These results suggest that NT H. influenzae strains that substitute ChoP on more proximal, exposed oligosaccharides chains may tend to have increased mutation rates within the repeat region of the licA gene. The strain population structure of NT H. influenzae is genetically very diverse and clones or clusters of NT H. influenzae strains that differentiate virulent from commensal strains have not been identified [10, 41]. Given this diversity, together with the high prevalence of NT H. influenzae colonization in the healthy human population, it is reasonable to hypothesize that not all NT H. influenzae strains possess the same ability to cause disease, but rather, that a proportion of strains possess a range of variable genetic traits that allow for infection and disease under the right host conditions . Thus, comparison of genetic trait prevalence between populations of NT H. influenzae and the closely related but strictly commensal species, H. haemolyticus, will highlight traits within the species' gene pools that may offer clues to the virulence pathways of NT H. influenzae. For instance, ChoP expression in NT H. influenzae is strongly implicated as a virulence factor [43, 44] and is thought to enhance virulence though increased epithelial cell adherence, inhibition of bactericidal peptides, and modulation of the immune system during biofilm growth [20–22]. In this study, 58% of H. haemolyticus strains lacked a lic1 locus (and the ability to express ChoP) while only 8% of NT H. influenzae strains lacked a lic1 locus, suggesting that, at a population level, ChoP expression may provide an advantage for more NT H. influenzae strains to cause disease. Furthermore, the trend of shorter licA gene repeat regions in H. haemolyticus strains that possess a lic1 locus (and the potential to express ChoP), may suggest that those strains have a slower phase-variable response to host defences targeting ChoP (i.e. CRP), potentially limiting their survival in inflammatory environments. Obviously, prevalence differences in ChoP expression alone do not account for all differences in disease potential between the species since many other virulence factors have been described for NT H. influenzae. Rather, the differential prevalence of genetic traits between the species highlight factors that may be further studied for their roles in virulence using in vitro and in vivo models of NT H. influenzae infection. Although the structure of H. haemolyticus LOS is unknown, the assumption has been made that basic LOS structures and biosynthesis of ChoP modifications, mediated by the phosphocholine transferase, LicD, are comparable between NT H. influenzae and H. haemolyticus. Some evidence suggests that these assumptions are reasonable. In the tricine SDS-PAGE experiments of this study, H. haemolyticus LOS migrated at a rate similar to the LOS of NT H. influenzae, and H. haemolyticus LOS also presented intra and inter-strain structural heterogeneity similar to the LOS of NT H. influenzae (Figure 1). Recent structural analysis on the LOS of Haemophilus parainfluenzae, a member of the Pasteurellaceae family that is phylogenetically more distant to NT H. influenzae than H. haemolyticus, revealed that the inner core structure was nearly identical to that of NT H. influenzae. Furthermore, the LicDIII and LicDIV alleles of the two H. haemolyticus strains in this study demonstrated higher sequence identity (95-99%) to their cognate proteins in NT H. influenzae than similar comparisons of LicA, LicB, and LicC proteins (87-94%, Table 1), suggesting a functional equivalence of the LicD protein alleles. Although these observations are circumstantial, they argue for more detailed comparisons of LOS structures between NT H. influenzae and H. haemolyticus to identify dissimilarities between the structures that may be associated with the ability of NT H. influenzae to cause disease. The results of this study suggest that genotypes facilitating LOS-ChoP structures that are not conducive to CRP binding predominate among the strain populations of both species; the majority of H. haemolyticus strains (58%) lacked a lic1 locus (indicating no ChoP expression) and the majority of NT H. influenzae strains either lacked a lic1 locus or possessed a single licD I allele (an allele known to dampen CRP binding by positioning ChoP substitutions from the proximal inner core heptose) (54% total strains). In comparison, strains possessing single licD III and licD IV alleles were in smaller, but similar fractions in the strain populations of both species (16-23%), indicating that these allelic distributions are still maintained in the species despite possible increased vulnerability to CRP binding. Further studies that assess the prevalence of licD alleles between epidemiologically comparable collections of virulent and commensal NT H. influenzae strains may highlight which alleles are important in NT H. influenzae disease. One ChoP genotype that may be associated with NT H. influenzae disease isolates is the possession of two lic1 loci in the same strain where each locus contains a different licD allele, providing the bacteria with two independently phase-variable ChoP substitutions. Fox et al  demonstrated that 4/25 (16%) NT H. influenzae middle ear strains had dual lic1 loci. In the current study, only NT H. influenzae and not H. haemolyticus possessed dual lic1 loci. Although only 7 of 88 (8%) total NT H. influenzae strains had dual loci, six were present among 43 (14%) middle ear strains present in this collection (unpublished results). Fox et al. also noted that the genome sequenced NT H. influenzae strain, R2846, possessed a complete and partial lic1 loci, each containing a different licD allele, raising the possibility that other strains may have a similar genotype. An extensive search on the lic1-containing strains in this collection using licD-specific PCR and hybridization, however, did not identify any strains (apart from the seven dual lic1 locus strains) that contained more than one licD allele, suggesting that the NT H. influenzae population contains mainly complete copies of lic1 (unpublished results). Although NT H. influenzae LOS structural studies have identified ChoP modifications on oligosaccharides extending from the heptose II position , specific licD alleles mediating this arrangement have not been characterized. It is possible that one or more of the current LicD alleles may overlap in this process or that stochastic factors in LOS biosynthesis may play a role. In addition, the clustering analysis of LicD protein alleles present in Figure 2 suggests that sub-variants may exist within the major allelic groups, and it is possible that one of these variants may facilitate heptose II-associated ChoP substitutions. As reviewed by Moxon et al , strains that are genetically and epidemiologically unrelated vary widely in the lengths of SSR (including licA tetranucleotide repeats), while individual strains that transmit within an outbreak or are extensively subcultured over time maintain a central modality in repeat numbers [32, 33]. Using a larger number of samples from a phylogenetically defined collection of NT H. influenzae strains has allowed us to partially resolve distribution trends for the licA repeat region in the NT H. influenzae and H. haemolyticus populations (Figure 3) and make statistical comparisons between and within species (Table 3). We found statistically significant trends toward the increased length of licA tetranucleotide repeats in NT H. influenzae compared to H. haemolyticus, and in NT H. influenzae strains with licD III alleles compared to NT H. influenzae strains with licDI or licD IV alleles. Longer repeat regions are predicted to increase lic1 loci mutation rates and ChoP phase variation, providing increased resistance to host clearance mechanisms such as CRP or antibodies that bind ChoP and initiate complement mediated bactericidal killing. The presence of the longest repeat (56 repeats) in a H. haemolyticus strain and only five repeats in a licD III -containing NT H. influenzae strain, however, are reminders that these trends must be considered in the light of numerous other factors that contribute to the commensal life style of both species and disease potential of NT H. influenzae. In summary, the lic1 locus is not part of the conserved "core" genome of the H. influenzae population but is part of the flexible gene pool that exists among different strains . Nonetheless, the conserved chemical nature of ChoP and the discovery of anti-ChoP antibodies in human serum provides reasonable credence to ChoP as a vaccine candidate that may inhibit H. influenzae at some point in the infectious process. Knowledge of how ChoP expression varies both genetically and structurally within the NT H. influenzae strain population is critical for designing intervention strategies that will effectively target disease-related strains. Furthermore, contrasting the genetic properties of NT H. influenzae ChoP expression with those of H. haemolyticus, a closely related but non-pathogenic species, has highlighted a number of ChoP expression differences (lic1 copy number, licD alleles, and licA repeat number) that may provide an advantage to disease-related growth in NT H. influenzae. For most studies, bacteria were grown on chocolate agar plates (BBL). ChoP expression was carried out on Levinthal agar . All cultures were incubated at 37°C with 5% CO2. The 88 NT H. influenzae and 109 H. haemolyticus strains were parts of various collections obtained by this or other laboratories in previous studies [13, 49–54] . All clinical and commensal strains in the current study were used with the approval of the University of Michigan Institutional Review Board. These same strains have been previously characterized for their taxonomic and phylogenetic relationships . Reference strains used in this study included the complete or partially genome sequenced H. influenzae strains Rd (KW-20, ATCC 51907), 86-028NP [NT nasopharyngeal strain associated with otitis media], R2866 (INT-1, ATCC 51997; a NT, invasive strain), and a H. haemolyticus type strain, ATCC 33390. A negative-control species, N. meningitidis strain G1723, was used in dot-blot hybridization. Two H. haemolyticus strains, M07-22 and 60P3H1, were used to detail the lic1 locus and demonstrate ChoP expression in H. haemolyticus. M07-22 is a hemolytic strain obtained from the throat of a healthy child attending day care and 60P3H1 is a non-hemolytic strain from the sputum of an adult with COPD (although not associated with COPD exacerbation) [10, 13]. Purified genomic DNA for Southern blots or PCR template was obtained from bacterial strains using the Wizard Genomic DNA purification kit from Promega, Co. (Madison, WI). Oligonucleotides for PCR amplification of gene probes, lic1 loci, and licD alleles were synthesized by Invitrogen and are shown in Table 4. PCR amplification of the tetranucleotide repeat region was performed as previously described  and sequence analysis was done with the primers listed in Table 4. PCR conditions have been described elsewhere  and all amplification products were confirmed by 1%-agarose gel electrophoresis. DNA sequences of the lic1 loci of H. haemolyticus strains M07-22 and 60P3H1, the licD allelic genes and the tetranucleotide repeat regions of all strains in the collection possessing licA-licD genes were obtained from PCR products purified on QIAquick columns from Qiagen (Valencia, CA). Automated fluorescent dideoxy-DNA sequencing was done by the University of Michigan DNA sequencing core on an ABI model 3730 sequencer. Sequence editing and gene and locus assembly were done with Lasergene software (version 7.0; DNAStar, Madison, WI). Cluster analysis of the LicD protein alleles was done using Mega software (version 3.1) . A bootstrap consensus, minimum-evolution dendrogram of LicD amino-acid sequence was made with 1,000 replicates. The bacteria were harvested in PBS to an O.D.600 of 1.0, lysed, and frozen as previously described . 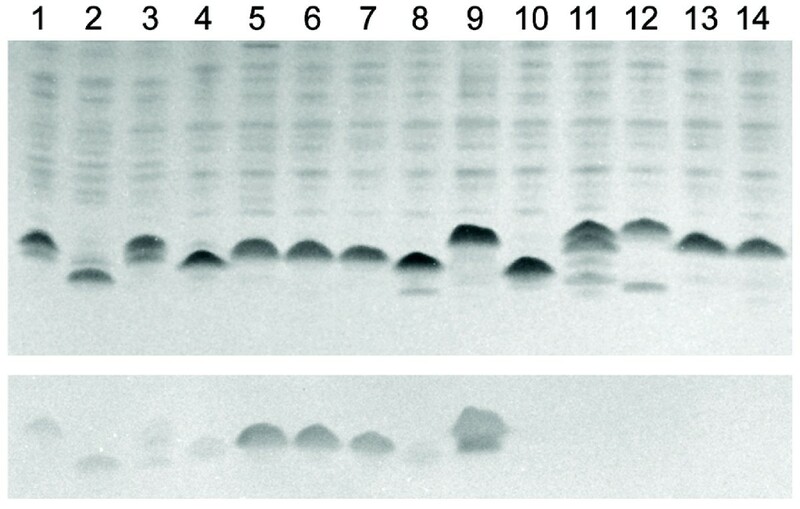 For dot-blot analysis, 40 μl of crude lysate DNA obtained from Haemophilus strains grown on chocolate agar was applied in an 8 × 12 array on nylon membranes as previously described . PCR-amplified genes were purified from agarose gels using the QIAquick Gel Extraction Kit (Qiagen), and labeled with the AlkPhos Direct™ Labeling and Detection System (GE Healthcare, Piscataway, NJ). Probes were hybridized to the dot-blot membranes under stringent conditions and developed by the ECF detection system (GE Healthcare). Probe signal intensity was read by a Storm™ 860 phosphorimager and analyzed with ImageQuant version 5.0 software (Molecular Dynamics/GE Healthcare) . Southern blots to identify lic1 loci in H. haemolyticus strains M07-22 and 60P3H1 or to determine the prevalence of lic1 locus duplication in all strains with licA-licD genes contained purified strain DNA digested with Eco RI and Mfe 1, respectively. As previously reported by Fox et al , strains with duplicate lic1 loci appear on Southern blots as two Mfe 1 fragments that hybridize with either licA or licD gene probes. In our study, we used a licD gene probe consisting of combined PCR products representing all three licD alleles (licD I from NT H. influenzae strain 86-028NP and licD III and licD IV from H. haemolyticus strains M07-22 and 60P3H1, respectively). All gene probes were labeled, hybridized, and detected as described for dot-blot hybridization, above. Whole-cell lysates for SDS-PAGE and Western blotting were obtained by harvesting bacteria in PBS to an O.D. of 1.0, and diluting 4 fold in tricine sample buffer. In the proteinase K experiments, 10 μl of the suspension was incubated with .5 mg/ml of proteinase K at 55 °C for 2 hours. Untreated or treated bacterial suspension and equal volumes of sample buffer were then heated at 100 °C for 10 min. and 3 μl of preparation were loaded and run on Novex 16% tricine SDS-PAGE gels and XCell Surelock™Mini-Cell apparatus (Invitrogen, Carlsbad, CA) according to the manufacturer's recommendations. Western transfer was performed on a Mini trans-blot apparatus from Bio-Rad on nitrocellulose membrane (NCM) from Millipore (Bedford, MA). Colony blots were prepared by suspending one colony from the strain of interest in 1 ml of PBS, and plating 100 μl of 10-6 and 10-8 dilutions on Levinthal agar. Following overnight growth, the colonies were blotted onto NCM discs (Millipore), and the blots were immediately washed in PBS and immunoassayed. Western and colony-blot immunoassays were performed by first blocking membranes in PBS containing 2% non-fat dry milk [blotto ] for one hour. The blots were then placed in TEPC-15 mAb (Sigma) diluted 1:5000 in blotto for one hour, washed three times with PBS and incubated for one hour in PBS containing 1:5000 goat, anti-mouse IgA antibody conjugated to alkaline phosphatase (Sigma). Following three washes with PBS, a colorimetric reaction was obtained with nitroblue tetrazolium chloride (NBT)/5-bromo-4-chloro-3'-indolyphosphate p-toluidine salt (BCIP) substrate (Pierce, Rockford, IL). All prevalence data were entered in Excel software (Microsoft) in binary form for the presence (which was given a value of 1) or absence (which was given a value of 0) of any given ChoP-associated genotype. The prevalence ratios of genotypes between NT H. influenzae and H. haemolyticus were calculated as a ratio of the proportions of genotypes among each species. Chi-square analysis was used to determine the significance of the differences of the genotype associations between species. Statistical analyses were performed with SAS software (version 9.1). Statistical differences in the length of repeat-regions were tested by pair-wise comparisons with the student's T test. This work was supported, in part, by Public Health Service grants R03DC006585-01 to KWM and an ARRA 2009 supplement for R01DC005840-07S1 to JRG and KWM from the National Institute on Deafness and Other Communication Disorders. KWM conceived and directed the study design, performed genetic and immunologic assays, and wrote the manuscript. JX performed genetic assays and did the statistical analyses. CFM and JRG helped in the study design and draft of the manuscript. All authors read and approved the final manuscript.